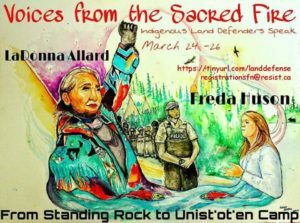 On the weekend of Friday March 24th to Sunday March 26th, Indigenous land defenders are converging in Vancouver, unceded Coast Salish Territories. The gathering has been called by Freda Huson, spokesperson of the Unist’ot’en clan of the Wet’suwet’en, who has built and maintained a camp in the direct line of multiple proposed pipelines outside of Houston, B.C. The Unist’ot’en camp is facing impending attacks by the RCMP as early as April 2017 to clear the way for construction of the Pacific Trails and Coastal Gaslink natural gas pipelines, projects of Chevron, TransCanada, and Shell. Huson has called for land defenders from across B.C. and beyond to join with supporters over the weekend to build the Sacred Fire Network, an organized network that will respond to attacks against land defenders’ assertion of sovereignty on their ancestral territories. The Unist’ot’en camp has stood in the paths of multiple pipelines for the past seven years, and faced many incursions by the RCMP and resource extraction company workers. This gathering is called as part of the camp’s preparation for a long, hot summer of resistance. The Unist’ot’en camp has seen steady support from anti-colonial, environmental, Indigenous sovereigntist, and anti-capitalist supporters who either donate time and skills directly at the camp itself or contribute through material and financial support. Anticipating increased police attacks, Huson has spoken to the need to better organize this camp support. Some supporters have come to the camp with valuable skills, but have not been able to respond when there are time-sensitive needs. Other supporters have come with little skills to offer the camp, and have at times taken up space and resources. Overall, Huson’s leadership has communicated the need for supporters of Indigenous land defense to respect and honour the protocols of Indigenous communities, to consider what skills and abilities can be offered to the camp, and to work together to better coordinate our support. The weekend convergence of Indigenous land defenders will result in establishing the Sacred Fire Network, which will coordinate supporters who have different skills and abilities as Indigenous land defenders call out for direct action mobilization in the coming months. The weekend begins with a public event on Friday evening with seven Indigenous land defenders speaking about the struggles they are engaged with on their territories. Freda Huson will update listeners on the fight against multiple pipelines on her ancestral territory. Richard Wright is the spokesperson for the House of Luutkudziiwus of the Gitxsan Nation and is standing at Madii Lii against the Prince Rupert Gas Transmission Line. Brandon Gabriel (Kwantlen First Nation) and Melinda Kachina Bige (Cree and Dene from Lutsel K’e, Northwest Territories) will share about the fight against Kinder Morgan on Kwantlen Territory. Patty Lawson (Lax Kw’alaams) and Christie Brown (Haisla and Gitxsan) will update us about the fight at Lelu Island against Petronas. Kanahus Pelkey (Secwepemc Women’s Warrior Society), Sakej Ward (Mi’kmaw from Esgenoopetitj (Burnt Church First Nation and Wolf clan), and Ladonna Brave Bull Allard (Standing Rock Sioux) will share their experiences in struggles ranging from fights against the Sun Peaks Resort and Imperial Metals, to advising warrior societies, to experiences on the frontlines against the Dakota Access Pipeline. These land defenders will give context for the struggles occurring on each of their ancestral territories. Supporters can learn about how resource extraction projects in B.C. are a major part of capitalist and colonial forces that continue the dispossession of Indigenous lands and the destruction of pristine ecological environments. On Saturday and Sunday, these rural Indigenous land defenders along with representatives from additional territories spanning the colonial U.S.-Canadian border will gather with urban Indigenous people and supporters for two full days of workshops and meeting sessions. On Saturday, a series of workshops will be held, public and open by registration, for supporters of rural Indigenous land defense. In the workshops for supporters, participants will gain knowledge and skills that can directly contribute to the fights against resource extraction projects on Indigenous territories. In addition, a component of the weekend includes discussions about each of own relationships to land and to the Indigenous territories we reside on. There are many ways in which our social positions indicate and require different relationships to land. For example, many urban Indigenous people reside on territories that are not their own; we live removed from our ancestral lands, and may have various relationships to our communities and Nations. People with different status residing in Canada may have Indigenous relationships in their places of origin, but also reside as guests on Indigenous territories in B.C. Regardless of our relationships to land, Indigenous land defense struggles in B.C. are significant to all of our understandings of anti-colonial and anti-capitalist resistance. These struggles against resource extraction projects are one of the frontlines facing impending attacks by state and corporate forces. Supporting Indigenous land defenders is an important act of solidarity and an expression of anti-colonial and anti-capitalist politics. On Sunday, everyone will gather together to brainstorm the building of the Sacred Fire Network, a transregional network of support for direct action resistance on Indigenous territories facing resource extraction projects. In the past, the Unist’ot’en Solidarity Brigade has bottomlined support coming from the Vancouver area. 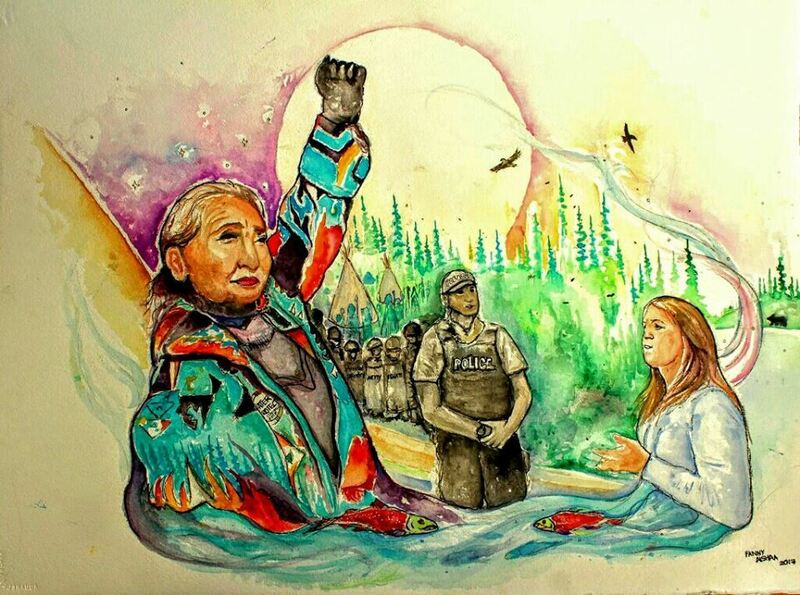 Individuals from across North America have also formed direct relationships with the Unist’ot’en camp. But we have lacked organization in our efforts, and at times misunderstood the importance of providing support to other sites of land defense, such as Madii Lii, Lelu Island, and opposition occurring on Kwantlen territory. The Sacred Fire Network will take leadership from Indigenous land defenders and coordinate supporters to respond to direct calls from the many sites of struggle against resource extraction projects across B.C. The Network will organize trans-regionally, pulling together supporters in Vancouver and additional urban and rural areas. This emerging Network is calling for people who want to contribute time, support, resources, or skills to show up at next week’s convergence. See this event posting for information about the Friday night public event. And click here for information and the link to register for attending Saturday and Sunday’s gathering.